Step 1 – It is quite simple to place your first stake on Monopoly – You're In The Money Slots. Simply click on the +/- line bet button to adjust your bet from between 1p to £10 per line. 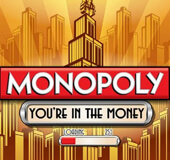 Step 2 – There are a total of thirty pay lines possible for you to activate in Monopoly – You're In The Money Slots. Click on the lines button to adjust how many you wish to play with. Step 3 – if you're all set, then click on the yellow spin button to begin play, or the auto-spin button if you want to keep the same stake for each consequent spin. Monopoly YITM (you're in the money) slots, based on the classic Monopoly board game, is one of the hottest online slot games around. Produced by IGT and loaded with bonus rounds, sharp graphics and fabulous animations, Monopoly Slots YITM is truly one of the top online slots to play! Not to mention, the chances to WIN mega money are huge as players are able to cash-in up to 12,000 times their payline bets. Be on the lookout for Monopoly YITM's two awesome bonus rounds, Mystery Wild Bonus Round and Board Bonus which are jam packed with high-end 3D visuals that put you right in the game. Race around the board and land on the right properties and you have the chance of unlocking the extra mini slot machine, receiving bonus rolls of the dice and of course taking it to the bank with the 12,000 times the payline multiplier. 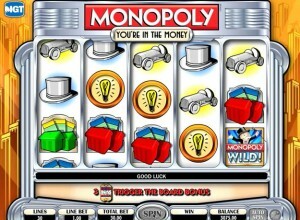 You can either play free Monopoly slots or pay for play and win REAL CASH! Roll the dice, pass go and collect tons of money with this brilliant 3D slot, Monopoly YITM.